Estate Vineyard - Jaffe Estate - Napa Valley estate-grown Cabernet Sauvignon, Metamorphosis, and proprietary blend, Transformation. You're not likely to come across children's toys among the rows of most Napa Valley vineyards. But Jaffe Estate is different. A family lives and plays here, in a lush, garden-like setting where something is always growing, changing, unfolding. And where someone is always looking at the stars. Situated in the St. Helena viticultural district and bounded by the Rutherford bench to the south, the Jaffe vineyard is ideally located to produce exceptional wine grapes. Its position in the middle of the St. Helena alluvial fan combined with its Bale Loam soil creates the classic conditions for producing reserve-quality red wines. Merlot and Cabernet Sauvignon vines that have been thriving in Napa since the 1970s are planted 8 feet apart, with 10-foot spacing between rows. They are pruned into quadrilateral cordons and maintained as a divided canopy--all to nurture the supple and nuanced fruit that flourishes in these elements. If it sounds like Jaffe grapes are coddled, consider this: When your family home sits in the middle of a vineyard, you attend to the soil and the water, the budding and the leafing, the sun and the fog differently. Factor in the observatory standing shoulder-to-shoulder with the vines, and the powerful presence of light that has traveled inconceivable distances to reach this very spot. Suddenly, the gift of the present stands out in bright relief. Jaffe Estate wines originate from that profound connection to the land, the hills, the story, the sky and the rich possibility of the Napa Valley. Recognized as Napa's leading authority on soil health, Michael Neal's expertise extends from the roots of the vine to the vineyard canopy. His company, M&L Vineyard management, performs custom farming, pest control, harvesting and related duties for 35 Napa Valley vineyards ranging in size from half an acre to 80 acres. He began tending vines as a teenager on his family's 13-acre property north of Rutherford. When his father started working other vineyards in addition to his own, Michael followed suit. He took time out to earn a Bachelor of Science in Viticulture from California State University at Fresno in 1979, and has kept his hands in Napa soil ever since. Michael has served for years on the boards of numerous influential agricultural and preservation organizations, including the Jack L. Davies Napa Agricultural Land Preservation Fund, the Napa Valley Viticultural Technology Group and the Napa County Farm Bureau. 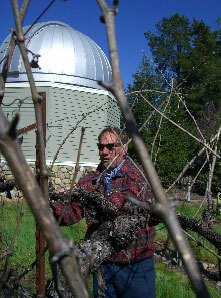 He enjoys working the Jaffe vineyard because its size allows for custom maintenance of each vine.